Almost twenty years ago, a young Canadian woman, Mary Jane Gagnier, travelled through Mexico on a journey of self-exploration. One evening on the zocalo in Oaxaca, she met a weaver from the nearby village of Teotitlan del Valle, who offered his uncles' help in repairing her broken clarinet. Shortly thereafter the two were married, and rather instantly the Ontario native with wanderlust found herself intimately immersed in the culture and traditions of her new home. Fiestas are synonymous with Mexico and daily ceremonial rituals and celebrations are at the center of Oaxaca's spiritual and social life. Gagnier de Mendoza chronicles the festival cycle in Teotitlan, a Zapotec village located fifteen miles from the capitol. The fiestas here center on the complex art of hosting, whether for family gatherings or religious ceremonies that involves traditional cooking and flower arranging, candle making and fireworks. Throughout the year, village brass bands regularly line the streets in processions featuring plumed dancers and masked actors. 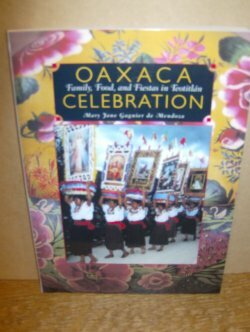 Beginning with Christmas posadas through Fiesta of the Black Christ of Esquipulas, pre-wedding and wedding celebrations, Lent and Holy Week, post-Easter revelry celebrating the patron saints, to the conclusion of the festival cycle with Day of the Dead, this memoir chronicles the spirit-life of an ancient community that day after day honors its gods as itself. 159pp.